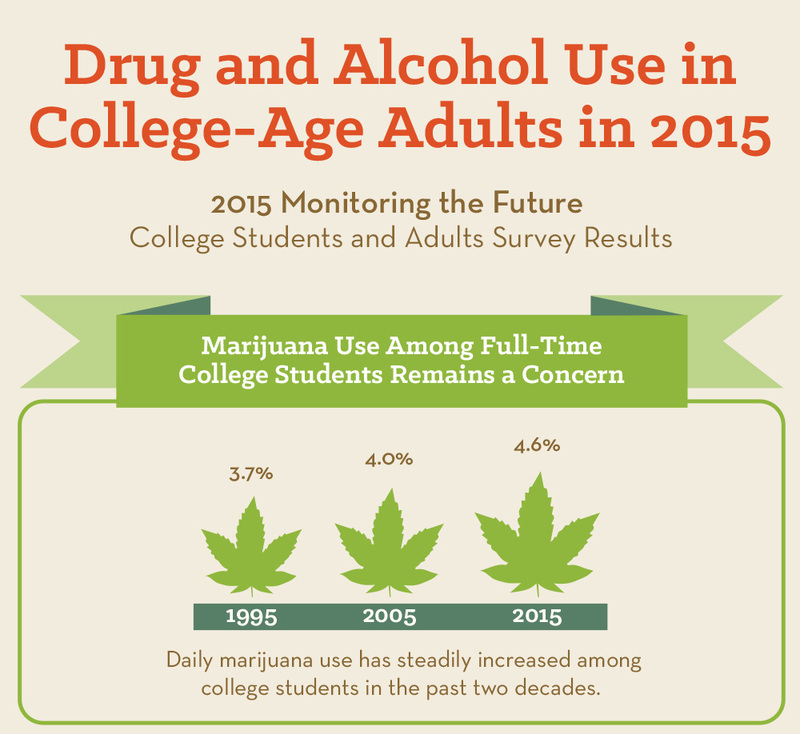 First Figure: Marijuana Use Among Full-Time College Students Remains a Concern. Daily marijuana use has steadily increased among college students in the past two decades with 3.7 percent smoking marijuana daily in 1995, 4.0 percent in 2005, and 4.6 percent in 2015. 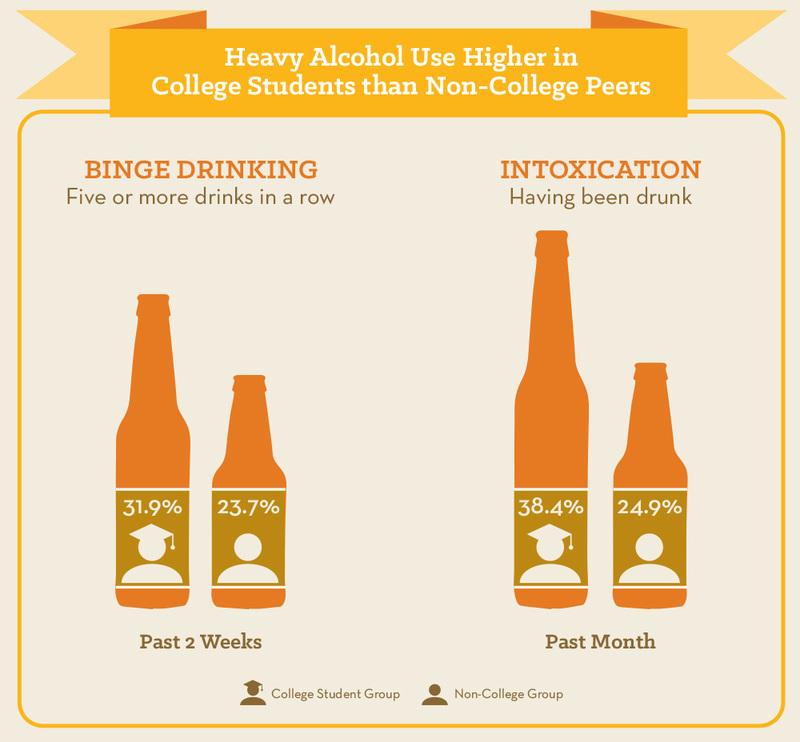 Binge drinking (five or more drinks in a row): 31.9 percent of college students and 23.7 percent of non-college peers in the past 2 weeks. Intoxication (having been drunk): 38.4 percent of college students and 24.9 percent of non-college peers in the past month. Third Figure: Nicotine Use Different in College Students and Non-College Peers. 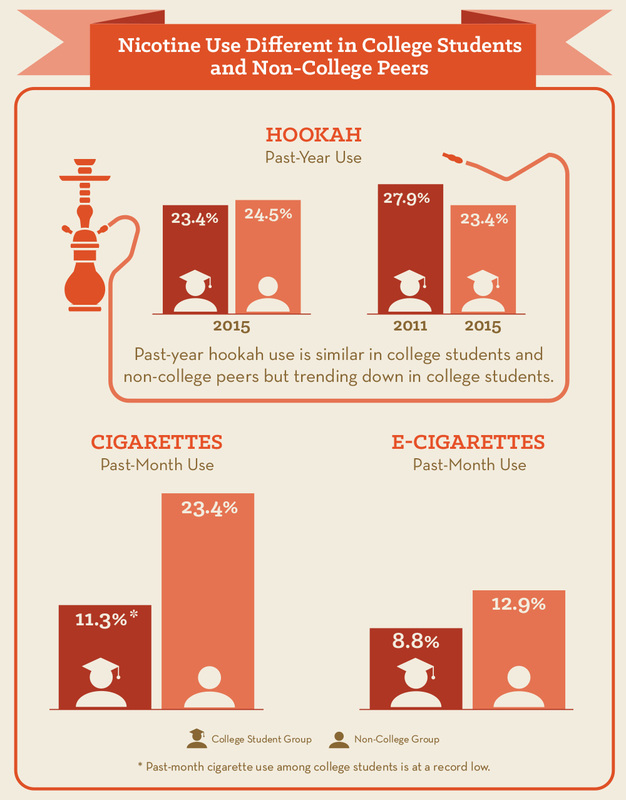 Hookah (past-year use): Past-year hookah use is similar in college students and non-college peers but trending down in college students: 23.4 percent of college students and 24.5 percent of non-college peers used a hookah in 2015; among college students, past-year hookah use was 27.9 percent in 2011 and fell to 23.4 percent in 2015. Cigarettes (past-month use): 11.3 percent of college students and 23.4 percent of non-college peers; note that this is a record low for past-month cigarette use among college students. E-cigarettes (past-month use): 8.8 percent of college students and 12.9 percent of non-college peers. 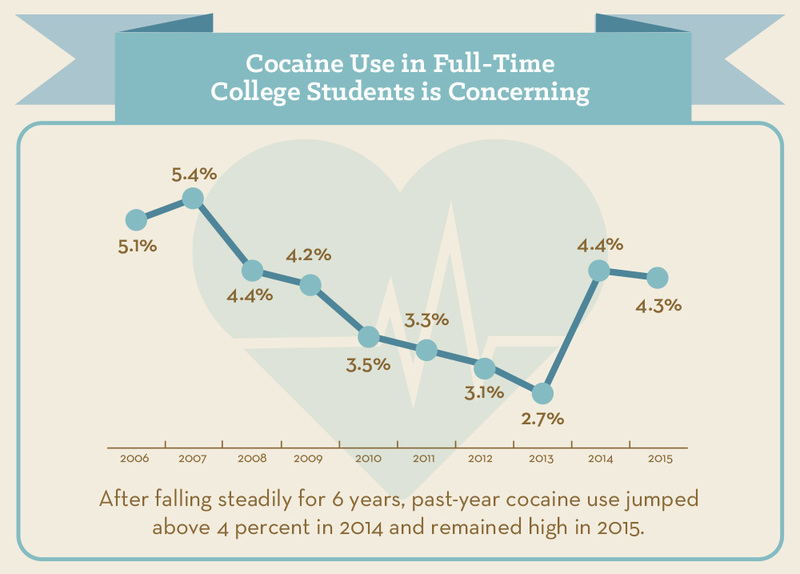 Fourth Figure: Cocaine Use in Full-Time College Students is Concerning. After falling steadily for 6 years, past-year cocaine use jumped above 4 percent in 2014 and remained high in 2015; past-year use was 5.1 percent in 2006, 5.4 percent in 2007, 4.4 percent in 2008, 4.2 percent in 2009, 3.5 percent in 2010, 3.3 percent in 2011, 3.1 percent in 2012, 2.7 percent in 2013, 4.4 percent in 2014, and 4.3 percent in 2015. 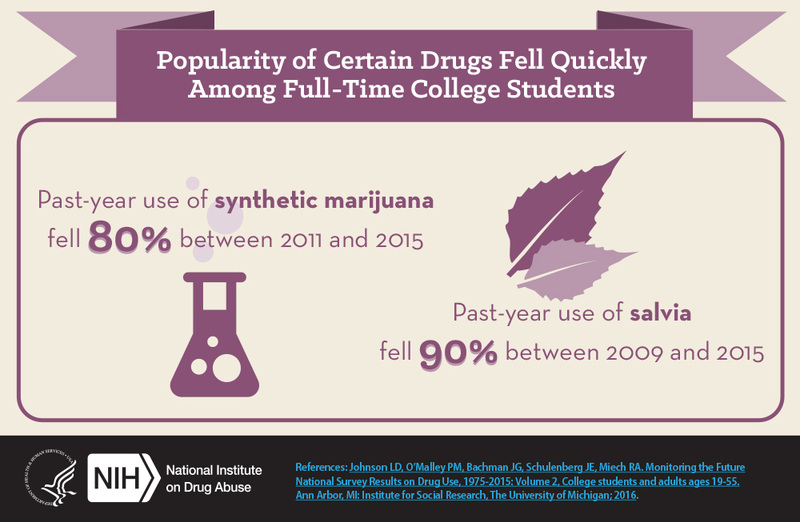 Fifth Figure: Popularity of Certain Drugs Fell Quickly Among Full-Time College Students. Past-year use of synthetic marijuana fell 80 percent between 2011 and 2015. Past-year use of salvia fell 90 percent between 2009 and 2015. Johnson LD, O’Malley PM, Bachman JG, Schulenberg JE, Miech RA. Monitoring the Future National Survey Results on Drug Use, 1975-2014: Volume 2, College students and adults ages 19-55. Ann Arbor, MI: Institute for Social Research, The University of Michigan; 2016.